All about SSI & PADI Scuba Dive Courses and certificates for certified divers on Phuket! Welcome to Merlin Divers, Kamala Diving Center on Phuket, Thailand. Experience the underwater world of diving. Continue your diving education with experienced dive instructors. The SSI Adventurer & PADI Advanced Open Water Diver course is in many ways the best Dive Course of all diving courses – there are no theory lessons to attend, no quizzes or a final test to pass. The dive course is an experienced based course – the idea is to give the students divers 5 introduction dives for 5 distinguished dive specialities. The course is done with Merlin Divers dive club over 2 days of diving. SSI & PADI determined that every Adventurer or Advanced Open Water Diver needs to have the experience of a Deep dive and a Navigation dive. The additional required 3 dives are up to the student’s interest and preferences. 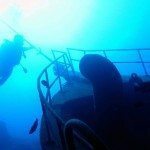 Since there are a few wrecks around Phuket a natural choice is the Wreck dive. Also, very popular are the following speciality dives: peak performance buoyancy, multilevel diving, underwater photography, fish identification, drift diving, wreck diving, boat diving – just to mention a few. The specific program of each course is always discussed in details with participants and Merlin Divers Scuba Diving center and school tries the best to accommodate any special request. Please understand that Merlin divers dive facility can not offer the divers an ice or altitude diving nor carries any dry-suits in our stock of rental equipment. In the high season – beginning of October till middle of May- the first day of the SSI Adventurer or PADI Advanced Open Water Divers course is preferably done on our half day trip on our local dive sites. From middle of May till end of September the first day of the course is preferably done on a day trip dive excursions to Racha Yai. 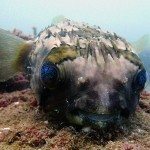 Consequently, the second day is a dive trip with 3 dives to any of the options for diving around Phuket, Thailand. Of course according to the choice of speciality dives chosen by the participant. The SSI Stress & Rescue and PADI Rescue Diver course is maybe the most physically demanding courses of all dive course. Since prerequisite of this course is being a SSI Adventurer or PADI Advanced Open Water Diver it builds upon the divers diving experience and what they have already learned, by adding the awareness and management skills to prevent problems and to manage them if they occur. The course with Merlin Divers dive instructor is done over 2-3 days depending on the time frame of the participants. To get certify as a Stress & Rescue or Rescue Diver the divers also need the proof of a current Medic First Aid with CPR (cardio-pulmonary resuscitation) certificate not older than 2 years. To become a PADI Divemaster means to get to know the world of professional recreational divers. A PADI Divemaster can work as a dive guide, tour leader or work as an Assistant Instructor. For both of these job domains you will get thoroughly trained and prepared by doing the course with Merlin Divers dive company in Kamala Beach on Phuket in Thailand. But the course is not only for divers motivated to work in diving. Many simply like to earn the Divemaster diploma to gain more knowledge and experience in recreational diving. Because the course duration is completely flexible. It can be done in as little as 10 days. Only recommended if the candidate has already lots of diving experience. Also, the course can be done comfortably in 2-3 weeks. What we offer to any candidate: The more time the candidates have to spent in Kamala on Phuket in Thailand for the Divemaster course, the more dives they will get in the waters and dive sites surrounding Phuket. In addition, for all the details about the course program visit the website of PADI. www.padi.com . Look for the PADI Divemaster course. You will find the information for prerequisites, required course material and the standards. 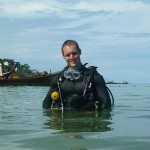 All that a PADI Divemster is allowed to do and teach. Most of all, a benefit for PADI Divemasters that is overlooked, but in the eyes of Merlin Divers dive instructors is quite positive, is the great sense of accomplishment and the rewarding feelings of self-esteem, self-confidence and self-respect associated with successfully completing the PADI Divemaster course. And so for many Divemaster candidates, having faced the challenges, sometimes even surpassing their personal limits are the greatest rewards and accomplishment they seldom achieve through other aspects of their lives. Be part of a small team of about 10 people of different nationalities. Help real customers who rely on the Divemaster for their advice. Help and assist, learn to be flexible and imaginative in solving daily situations. Ultimately all add up to the candidates feeling uplifted and more confident in themselves. In effect, the PADI Divemaster course is also in part about personal growth. Price: Depending on time available, diving experience and needing to rent the diving equipment. Please contact Merlin Divers scuba dive school by email [email protected] . Also mention the above factors and get a quote for the PADI Divemaster course with Merlin Divers Kamala Diving Center. Your dive shop in Kamala.